When your teeth become broken or fractured as a result of dental injury or trauma, endodontic therapy can help protect the fragile dental pulp within from microbacterial invasion. When cracks form in your teeth, the delicate system of tissues, nerves and blood vessels that comprise your dental pulp become highly sensitive and exposed to harmful bacteria. It is often a painful condition the can be addressed by endodontic therapy, otherwise known as root canal therapy. When the health of your dental pulp is compromised, root canal therapy becomes a necessary procedure because it treats the affected areas directly. In a relatively pain-free surgical procedure, a highly-trained professional will treat the affected tooth by cleaning out the infected dental pulp from your teeth, and thoroughly disinfecting the cavity it leaves behind. The cavity is then filled with dental materials that effectively restore your tooth. The thought of root canal surgery may seem daunting for some, but it is the single, most effective way for dentists to treat endodontic problems. 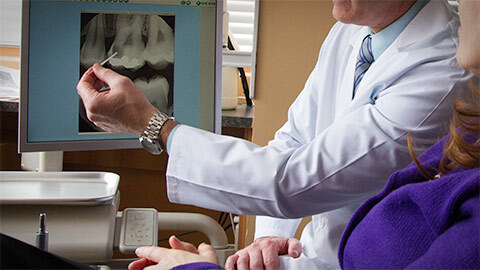 Dr. Hidlay is very experienced in endodontic treatments and root canal therapy. You’ll be in good hands throughout the procedure, but if you have any questions or concerns (or, if you’d like to book an appointment or consultation) feel free to contact us today.